Have you ever wondered how a state with over 800 public lakes and ponds and eight aquatic biologists can evaluate water quality? It would be impossible without the help of dedicated state-wide volunteers who offer their time to the New Hampshire Department of Environmental Services (DES). Monomonac’s volunteers are part of a network that works with the DES Volunteer Lake Assessment Program (VLAP). VLAP Is a volunteer-driven lake sampling program that assists DES in evaluating lake water quality, and provides with reports on lake health. 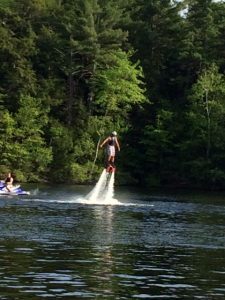 This cooperative effort allows biologists and lake associations to make educated decisions regarding the future of New Hampshire’s lakes and ponds. Why is VLAP Important to Lake Monomonac? A volunteer-driven water sampling program assists DES in evaluating water quality throughout the state, which helps empowers monitors and lake residents with information about the health of Monomonac. Regular gathering of water quality data from the lake and Its tributaries establishes a strong set of baseline chemical and biological data. This monitoring results in early detection of water quality changes, allowing DES to trace potential problems to their source. Our VLAP volunteer monitors are invaluable and they help to determine long-term water quality trends, and they educate lake and watershed residents, business and town on best management practices to keep our lake clean. 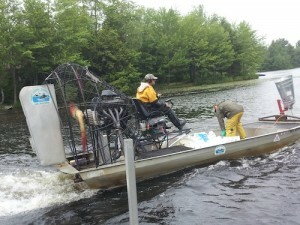 This program have been, and will continue to be, a key element in protecting Lake Monomonac. How Does VLAP Work?VLAP Is a cooperative program between the NH DES and MLPOA. Volunteer monitors are trained by DES to use lake monitoring equipment to collect lake water quality data, to survey the surrounding watershed, and to sample the streams and rivers that are tributaries to the lake. Sampling frequency is flexible, but we choose to sample monthly throughout the summer (June through August). Our lake must be sampled in the presence of a DES biologist at least once per summer. At this time the volunteer monitors have an opportunity to express any watershed concerns. The data gathered are reviewed for quality assurance and imported into the DES Environmental Monitoring Database (EMD). During the off-season, DES biologists interpret the water quality data, perform trend analyses, and compile the results into an annual report for each lake. Quality data gathered through VLAP also help DES to conduct statewide surface water quality assessments. Assessment results and methodology are published by DES every two years as a requirement of the Federal Clean Water Act. We receive the report once a year and the information is posted to the website. Frequently DES biologists present at our annual meeting. Volunteer monitors are dedicated, proactive lake stewards who are concerned for the well-being of their lakes.